Need Quality Commercial Glass Servicing? Whether you’re in Newark, NJ or the surrounding areas, House of Glass can help you with all of your commercial window, door and entryway needs. Whether you require a storefront system or industry solution such as a school or restaurant, we are ready to meet your needs. Since 1989, House of Glass has been the leading commercial glass company in Essex County, NJ. We’ve serviced hundreds of satisfied customers and bring years of experience to the table with installations and repairs. Call us now at 973-674-4228 to discuss the needs of your project. Throughout Essex and Morris Counties in Northern New Jersey you will find a variety of commercial glass door products that support the needs of the building and its occupants. 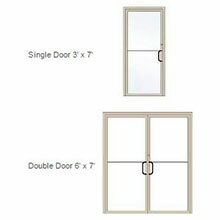 Sliding Glass Doors – you can find this type of commercial door at a hotel, retail shop or restaurant. Folding Glass Doors – typically used for a car dealership to allow large vehicles in a showroom. Frameless Glass Doors – similar to a frameless glass shower door, a commercial frameless door offers a less obstructed view between the interior and exterior. These are often found at shopping malls and hotels. Aluminum Glass Doors – Lots of retail shops use aluminum framed glass doors which withstand heavy foot traffic and allow plenty of light to pass through. When it is time to upgrade the windows and doors of your commercial building or storefront let us help you walk through the process to determine the best solution for your project. 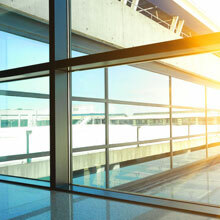 We have vast experience replacing tempered glass, and laminated safety glass and can introduce you to the latest Thermopane products on the market. No commercial glass project is too big or small. With decades of experience and a state-of-the art shop right here in Essex County you will get the expert attention you demand. Sometimes your existing commercial doors are still a great solution but may need some adjusting. Don’t let a loose door, unsealed window or dangerous situation hamper your business. House of Glass can install door closers, wind chains and more. If your door is acting up or not closing properly, let us take a look and we’ll be sure to address the problem. We’ve fixed thousands of commercial doors throughout Newark, Essex and Morris Counties in New Jersey. If you want your commercial glass door and window installation done quickly and professionally, contact House of Glass today. Our cost will be completely competitive and you will get the highest possible quality of service. Call us now at 973-674-4228 for a free quote.